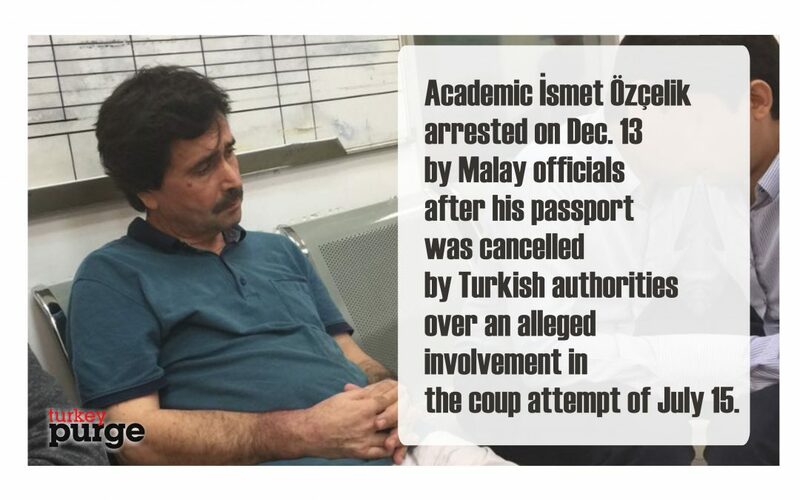 A Turkish academic with a valid Malaysian visa was arrested by Malay officials on Dec. 13 upon an alleged request by Turkish authorities in Malaysia. Lawyers representing Özçelik are now seeking renewal of the visa in order to secure his release from prison for an offense for which he has yet to stand trial or be convicted of.Muhammad Faizal Faiz Hasani, one of his lawyers, recently spoke to Malay Mail Online regarding the issue. Faizal said the Magistrates Court here had denied Özçelik bail because the Immigration Department had cancelled his visa just a day after his arrest on Dec. 13, 2016. “Ismet needs to get DG Immigration to re-validate his visa and determine why Immigration cancelled it. If it was at the request of the Turkish Embassy, why and on what grounds. More than 120,000 people have been purged from state bodies, in excess of 80,000 detained and some 40,000 have been arrested since the coup attempt. Arrestees include journalists, judges, prosecutors, police and military officers, academics, governors and even a comedian. Critics argue that lists of Gülen sympathizers were drawn up prior to the coup attempt.